We’d love your help. Let us know what’s wrong with this preview of Speed Brewing by Mary Izett. Get from start to smooth finish in a lot less time with your own fast and alternatively fermented beverages! The number of homebrewers is growing quickly as more people discover the joys of creating their own delicious libations from scratch. However, work, family, or other constraints can make finding the time to brew difficult. Time is often as precious as the beverages y Get from start to smooth finish in a lot less time with your own fast and alternatively fermented beverages! The number of homebrewers is growing quickly as more people discover the joys of creating their own delicious libations from scratch. However, work, family, or other constraints can make finding the time to brew difficult. Time is often as precious as the beverages you make! In Speed Brewing, Mary Izett solves the modern brewer's problem. No matter the beverage, it all comes down to Alcohol By Volume (ABV), batch size, and best practices. For example, five gallons of a big, heavy Russian Imperial Stout can take up to three months to create. Three gallons of a British Bitter can be ready to taste in about a week! The same applies to other beverages across the board. For meads and ciders, it's about the creative use of fruit and aiming for lower ABVs. Instead of making honey wine or apple champagne, choose honey beer and sessionable cider! Alternative yeasts and organisms such as SCOBIE (from the kombucha world) are thoroughly explored as well. 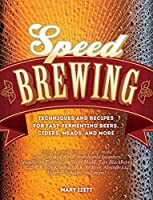 To ask other readers questions about Speed Brewing, please sign up. Out of my many fermentation books, this one is my favorite. Creative and well-written, it presents several families of fermented beverages, so we get a taste of everything. It also presents many recipes for each family, as well as simplified brewing technique. Unfortunately, I cannot give 5 stars because it often uses crazy american units like "1/16 of a tea spoon" instead of grams and doesn't cover rice wines. This was a Christmas present and it was excellent reading. I am super excited about Brew-in-a-bag and will be making Gose soon. The strawberry short mead is also in my future. I heard Izett talk at a brewing conference a few years ago and got to taste the short mead, it was amazing and now I have the recipe.